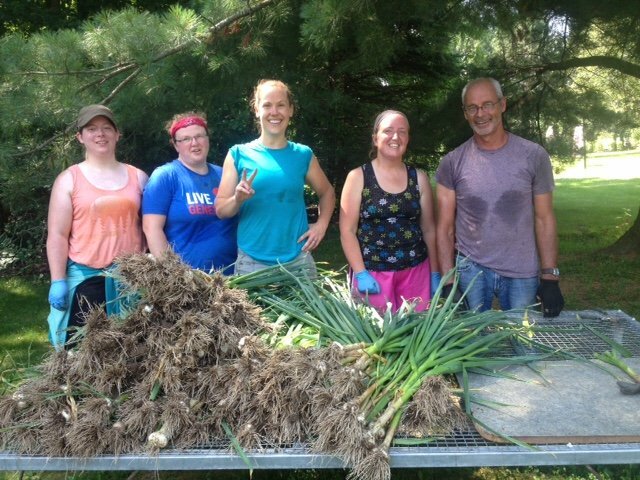 McDougal’s Farm is an Earth friendly, people friendly farm located just north of Antigo Wis.. We grow a diversified selection of quality produce grown with organic fertilizer, compost, water and sunshine! We do not use synthetic fertilizers, chemicals, herbicides or GMO’s…ever. We use sound sustainable growing practices and pay close attention to our soil health because we know healthy soil grows healthy vegetables and healthy vegetables grow healthy families. We love catering to our CSA members through our 18 week vegetable program (mid June to mid October). Click here for more information on CSA. McDougal’s Farm has several CSA drop sites conveniently located in Antigo, Wausau, Rhinelander and Merrill. We also offer our produce to Local / Antigo coffee shops, Wausau coffee shops, Antigo health food stores, and specialty restaurants in Central & Northern Wisconsin including Antigo and Wausau restaurants. Our unique greenhouse is open to the public briefly in early spring. Click here for greenhouse hours. It is filled with earthy mossy delights, hanging baskets and (noncertified) organically grown garden transplants including vegetables, herbs and flowers…..many heirlooms, especially tomatoes. Our carefully selected varieties have been field tested and found to be grower friendly in our northern climate. Looking for unique? Love earthy? Come see us in the Spring. McDougal’s Farm also host several educational workshops for children, as well as adults. These are usually held in our big sunny greenhouse. Click here for workshops. They vary every year on theme and time, so check back often not to miss the fun.